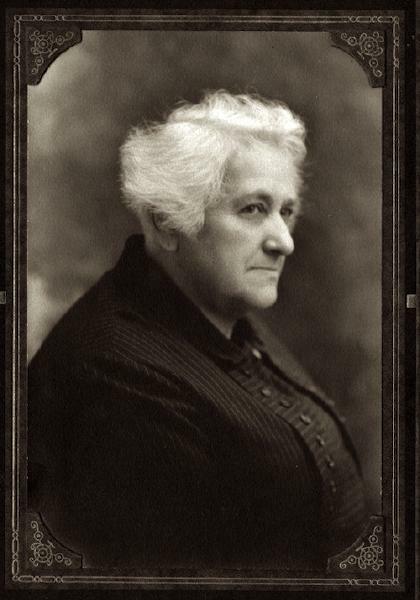 Johanna Stahle was born on 5 August 1858 in Niagara County, New York. She was baptized/christened on 12 September 1858 at Zion Lutheran Church in Niagara, Niagara County, New York, sponsored by Margaretha Fink. Konrad Stähle and Ursula Walter appeared in the US federal census of 1 June 1860 in Niagara Falls, Niagara County, New York, just a few households away from Lucy's sisters Anna Weiler and Barbara "Baumel.". Other members of the household included Johanna Stahle, Margaret Stahle and Catharine Stahle. Konrad Stähle and Ursula Walter, appeared in the US federal census of 1 June 1870 in Suspension Bridge, Niagara County, New York. Other members of the household included Johanna Stahle, Margaret Stahle, Catharine Stahle, Fred Stahle, Conrad Stahle, Barbara Stahle and Simon Andreas Stahle. She married Samuel Deveaux Williams, son of Samuel D. Williams and Mary (? ), circa 1875. Samuel Deveaux Williams and Johanna Stahle appeared in the US federal census of 1 June 1880 in Milan Township, Monroe County, Michigan. Other members of the household included Robert Deveaux Williams, Frederick L. Williams and Hiram Hobert Williams. Johanna Stahle became a widow at the 24 May 1898 death of her husband Samuel Deveaux Williams. Johanna Stahle appeared in the US federal census of 1 June 1900 in Milan Township, Michigan. Other members of the household included Hiram Hobert Williams, Belle Williams, Nellie Mae Williams, Edna Ann Williams, Howard Stahle Williams and Thurlow Samuel Williams. She was a farmer, according to the 1900 census. She married Herman Gaertner circa 1903. The following appeared on 9 October 1908 in The Niagara Falls Gazette: A very pleasant gathering was that at the home of Mrs. Margaret Weber of Willow avenue, on Wednesday, when occurred the reunion of the family of Mrs. Ursula Stahle. The only drawback of the full enjoyment of the occasion was the absence of two of Mrs. Stahle's sons, the eldest, Mr. Conrad Stahle of Cleveland avenue, being seriously ill. The house was beautifully decorated with ferns and flowers, the color scheme throughout the entire house being red and green. The time passed most pleasantly in meeting and greeting relatives and friends, old and new, many of whom met for the first time. A most bountiful dinner was served, after which Mrs. Daniel Behe sang several beautiful solos, and Miss Ursula Stahle rendered some instrumental music. Among the out-of-town guests were: Mr. and Mrs. James Hollenbeck and daughter Hazel, of Lockport; Mr. and Mrs. Daniel Behe, of Gasport; Mrs. Herman Gaertner and Miss Edna Williams, of Petersburg, Mich; Mrs. John Cleghorn and son Robert, of Cuba; Mr. and Mrs. Robert Fitzgerald and Mr. and Mrs. Fred Weber and daughter, of Buffalo. Many of those attending the reunion appear in the accompanying photograph. Herman Gaertner and Johanna Stahle appeared in the US federal census of 15 April 1910 in Petersburg, Monroe County, Michigan, at Center Street. Other members of the household included Howard Stahle Williams and Thurlow Samuel Williams. The following appeared on 10 April 1913 in The Niagara Falls Gazette: Mrs. Ursula Stahle, 83 years old, a charter member of Zion Lutheran Church and a member of the German Frauen, died last evening at the home of her niece, Miss Lillian Weber, No. 729 Willow avenue. Mrs. Stahle was born in Germany and came here when only 20 years old. She is survived by a son, Conrad, who lives in Cleveland avenue and three daughters, Mrs. J. S. Hollenbeck of Lockport, Mrs. Gaetner of Petersburg, Michigan and Mrs. John Kreghorn of Black Creek, N. Y. Funeral arrangements later. Note: Miss Leila Weber of 729 Willow Avenue was a granddaughter of Ursula Walter Stahle. Other misspellings spellings should be corrected to "Gaertner" and "Cleghorn." Johanna Stahle became a widow at the 14 March 1919 death of her husband Herman Gaertner. Clarence Burton Goetchius and Belle Williams appeared in the US federal census of 1 January 1920 in Spokane, Spokane County, Washington, at 2017 Seventh Avenue. Other members of the household included Johanna Stahle. The following appeared on 27 October 1920 in the Lockport Union-Sun & Journal: The home of Mr. and Mrs. James S. Hollenbeck of Strawberry Avenue was the scene of a pleasant gathering on Saturday evening, October 23, when a number of friends helped them to celebrate the forty-second anniversary of their marriage. A bountiful supper was served n the dining room, which was elaborately trimmed with decoratins in keeping with Hallowe'en. Three of the original wedding guests were present, Mrs. J. Gaertner and Mrs. H. Hunt, sisters of the bride, and William Romig, who acted as best man. The other guests were Mr. and Mrs. E. J. Behe, Mr. and Mrs. Christ Ramming, H. J. Hunt, Mr. and Mrs. Fred Hollenbeck and family and Mr. and Mrs. Daniel G. Behe and daughter Evelyn. Mrs. Fred Hollenbeck wrote a very appropriate poem for the occasiion. . . .
Mrs. J. S. Hollenbeck, Mrs. J. Gaertner and Mrs. H. J. Hunt left Tuesday morning for Cuba, N. Y., where they will visit their sister, Mrs. John Cleghorn, for a few days. . . .
Mrs. C. Stahle, William and Uras Stahle, of Niagara Falls, spent Sunday with Mr. and Mrs. James S. Hollenbeck. . . .
Mr. and Mrs. J. S. Hollenbeck and daughter Hazel, Mr. and Mrs. H. J. Hunt, and Mrs. J. Gaertner spent Sunday evening with Mr. and Mrs. Fred Hollenbeck. Johanna Stahle Williams Gaertner was photographed with granddaughter Doris, about 1924. Johanna Stahle Williams Gaertner was photographed about 1926 surrounded by many members of her large family. Johanna Stahle appeared in the US federal census of 1 April 1930 in Spokane, Washington, at 2017 Eighth Avenue identified as mother-in-law in the household of Harry and Estella Rosenhaupt, but the actual family relationship remains a mystery. Johanna Stahle died on 3 January 1931 at age 72 in Spokane, Spokane County, Washington. She was interred at Riverside Memorial Park, Spokane, Spokane County, Washington.